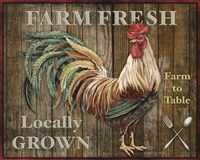 This rustic country print features a gold and red rooster surrounded by corn, sunflowers, pears, carrots, tomatoes and other farm grown veggies. Surrounded by a red and brown-tinted frame, this rooster is a classic example of rustic art. 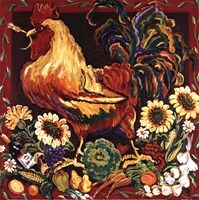 Painted by Suzanne Etienne, “Rooster Rustic” reflects the artist’s intrigue with gardens and farms. Reminiscent of the simpler times, this warm-colored painting would make a great addition to a French Country themed kitchen.